Apple’s new Podcasts app is a welcome step to bringing attention to audio and video podcasts that were previously buried in the Music app. But while it has some good things going for it, it’s a step that’s not yet fully realized. My colleague, Dan Moren, has written an admirable first look at the Podcasts app, so I needn’t go into extensive detail on how it works. The gist is that this app functions, in many ways, like the iBooks app, complete with ways to listen to podcasts as well as obtain new ones. Obtaining podcasts is one of the app’s strengths. Whereas in iTunes and in the iTunes Store app, podcasts could be lost among all the store’s other content, the Podcasts app brings such content firmly to the fore. To view available podcasts, simply tap the Catalog button and you’re taken to the store’s collection of podcasts. You can view this in a few ways. The first is by tapping the Featured button at the bottom of the screen. Do so on an iPhone or iPod touch and you see a few featured slots and then a list of podcasts that include both audio and video offerings. On an iPad there’s a New & Noteworthy area and, currently, a Podcaster Starter Pack section that includes the kind of podcasts—Radiolab, TEDTalks, and This American Life—that those new to podcasting will want to check out. Featured Performers: As with the iTunes Store app, you can view featured content in the Podcasts app. Tap Top Charts on an iPhone or iPod touch and you see the store’s top ten podcasts—this can include video as well as audio podcasts. On an iPad you see audio and video podcasts listed under separate headings. You can further narrow your search by tapping a Categories button and choosing a podcast genre such as Arts, Health, Music, News & Politics, or Technology from a list. Do so and the top podcasts for that genre appear. And, of course, if you know what you’re looking for, just use the Search field. When you’ve found a podcast you’re interested in, tap it and you can subscribe to the podcast, stream an episode, or download an episode. Once you’ve subscribed to a podcast, you can choose the option to auto-download new episodes when they become available as well as sort episodes by newest or oldest first and mark all as played or unplayed. Regrettably, there’s no way to create a playlist of podcast episodes. If you want that kind of functionality you must create those playlists in iTunes and sync your podcast episodes to your iOS device. The playlists will be available within the Music app rather than the Podcasts app. What isn’t clear—but welcome—is that you can additionally subscribe to podcasts that aren’t offered on the iTunes Store. However, the feature is anything but intuitive. 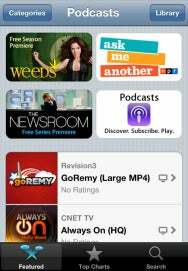 To subscribe to such a podcast enter the RSS feed for the podcast in the app’s Search field. When you do so and tap the Return key, you’re asked if you’d like to subscribe to the podcast associated with that RSS address. It then appears in your library of podcasts. The lack of playlist support and the hidden feature for subscribing to podcasts outside the iTunes Store is evidence of an app intended for a general audience rather than the podcast aficionado. Podcasts seems aimed at the person who listens and subscribes to a handful of podcasts but doesn’t require a lot of bells and whistles. (The bells-and-whistles crowd is better served by third-party apps such as Downcast ( ) and iCatcher ( ) that do offer such features.) With that audience in mind, Apple has loaded the Podcasts app with some intriguing interface elements, but sometimes sacrifices functionality to those elements. For example, while the library page is useful—allowing you to view shows by large thumbnail or in a list, the Top Stations feature needs a lot of work. 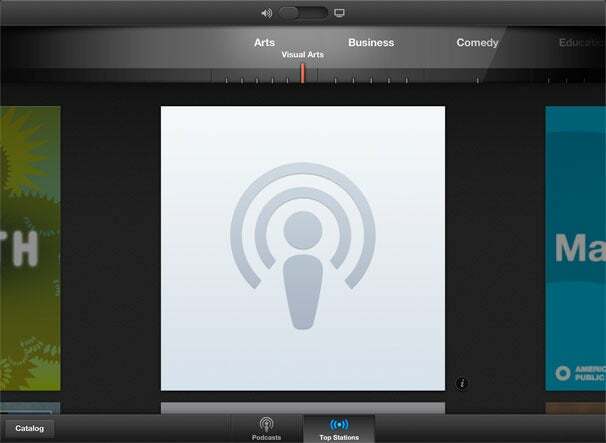 It’s laid out so that podcast categories such as Arts, Business, Comedy, and Education appear on a large side-scrolling wheel across the top of the screen. Within each large category are subcategories that appear as you move the wheel—Design, Fashion & Beauty, Food, Literature, Performing Arts, and Visual Arts in the Arts category, for example. Below, you see one large hunk of cover art. To see the next program you must swipe up to move to the cover art below. This cover art is the only thing that identifies the program. If a program lacks artwork (something I encountered many times) you have no idea what the program is until you tap the small Info button next to it. At this point, the artwork flips around (iPad) or scrolls up (iPhone and iPod touch) and you can see the show name, a Subscribe button, and available episodes that can be downloaded or streamed. If you’re new to podcasts and seek some of podcasting’s most popular shows, this can be helpful. But another, smaller view that offers multiple programs would be a more efficient and informative use of space. Drawing a Blank: When cover art is missing, you won’t know a program’s identity until you tap its Info button. The Now Playing screen for audio podcasts is another interesting design decision—some of which is useful and other bits, not so. When you first start playing a podcast, the Now Playing screen shows that large piece of cover art. Below the art are Back, Forward, and Play/Pause controls in addition to buttons for skipping back 10 seconds and jumping forward 30 seconds. If you’d like to view other episodes of the program, simply tap the Playlist icon in the top right corner of the screen and a playlist appears. To play an episode within that playlist, simply tap on it and it will stream to your device. This is all great and easy to use. 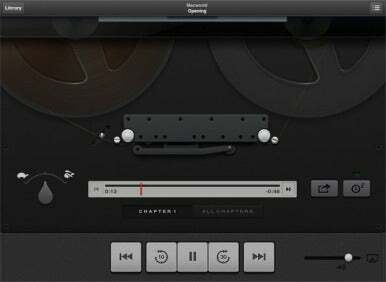 When you swipe up on this artwork you’re taken to the tape recorder view, where you find additional controls. Among them is a speed control for speeding up or slowing down the podcast without changing pitch (Apple claims the faster “rabbit” setting makes the audio play twice as fast. It’s actually about 1.5 times as fast.) You also find a timeline, a Share button for sharing links to the podcast via email, Twitter, or the Messages app; and a sleep timer button, which allows you to configure the podcast to play for a certain amount of time (from five minutes to an hour in increments) and then stop playing. As the episode progresses, the virtual tape on the reels decreases on the left reel and increases on the right. It’s a clever effect, but as the timeline shows you where you are in nearly all cases, it seems more gimmick than help. 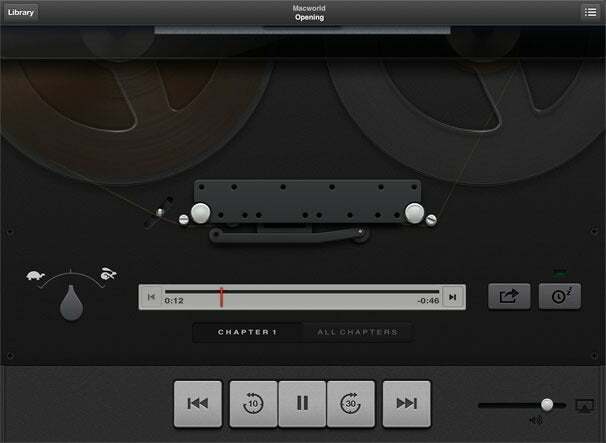 Like the built-in Music app, the Podcasts app supports scrubbing at a variety of speeds. Start a podcast playing and drag on the playhead. When you do, the podcast scrubs (plays short snippets of audio) at high speed. Drag your finger down while scrubbing and the scrubbing speed decreases from high speed, to half speed, to quarter speed, to fine scrubbing. You can scrub both back and forward. That timeline can be confusing in that it contains Back and Forward buttons that don’t appear to do anything—that is, until you play an audio podcast you’ve downloaded that contains chapters. When you play such a podcast, you see new chapter buttons below the timeline. The first button will read Chapter 1 and the second, All Chapters. When the episode gets to the next chapter, the name of the first button changes to Chapter 2. If you tap All Chapters, the timeline becomes segmented, with each mark indicating a new chapter. Chapter and Verse: The Podcasts app supports navigating via chapters, but provides no chapter titles. Those Back and Forward buttons in the timeline now come into play. When you tap on them, you skip back or forward a chapter, respectively. As you do so, the reels speed up to show that you’re skipping through a significant amount of time, which is kind of cute. But I’d like more from the chapters feature. When you listen to an episode that contains chapters in iTunes, you can easily navigate to other chapters by selecting them from a list (plus those chapters include their chapter titles rather than a generic “Chapter 1, Chapter 2, and so on). While Podcasts’ chapter button and segmented timeline work reasonably well with the timeline conceit, they’re not the most efficient way to move between chapters. The app is capable of syncing—to an extent. When you play a podcast episode on one iOS device and then move to another iOS device tied to the same Apple ID, playback on the second device will pick up where the first left off. (Provided, of course, that each device has Internet access.) However, this isn’t true between iOS devices and iTunes. (Apple makes no claim that it is.) The Podcasts app won’t bookmark a podcast in iTunes so that when listening on your computer you can continue from where you last stopped. Additionally, subscriptions don’t sync. So, if you’ve subscribed to a podcast on your iPad and later fire up your iPhone, you won’t find that podcast on your phone. If you want it, you have to subscribe to it on that device. Once you do, playback between the two devices will be synced. This lack of subscription syncing seems odd, particularly given that an app like Downcast can do it, using Apple’s own iCloud service to do so. While I’ve been more critical than encouraging in this review, Podcasts isn’t a terrible app. People new to podcasts will find it useful and reasonably easy to operate. And the fact that Apple broke podcasts out of the confines of a busy store is a boon for fans (and soon-to-be-fans) of the spoken word. But with its occasionally quirky interface and lack of features such as iTunes and subscription syncing, it’s only a modestly capable first step. I’m hopeful that we’ll see some significant tweaks and improvements in the next iteration. In the meantime—for the price of a couple of bucks—the App Store has a handful of better podcast apps.